Very happy with my purchase. Beautiful, soft, tailored, just what I was looking for. 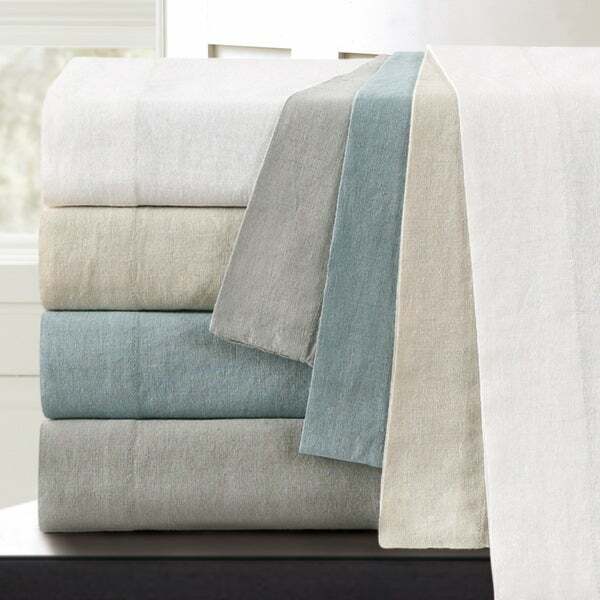 Echelon Home's washed linen cotton euro shams combine the two most comfortable natural fibers. This blend marries the distinctive texture and durability of linen with the softness of cotton to create comfortable, chic bedding at a fraction of the price of 100-percent linen. They are pre-washed for added softness and casual appeal. Good quality linen pillow shams that fit my pillows perfectly. The border is not too large, but large enough to notice. The feel of the linen is not too rough but you can tell they’re real linen. I was pleased with this purchase. These are nice shams but they were too big for my pillows. I also put them in the wash and they came out very wrinkled from the dryer. That's not a problem, though. I just ironed them. They are a very pretty grey color and look nice (although big) on my bed. I will have to buy bigger euro sham inserts for these, however. It was a great price. Other retailers sell them for much more! I've been looking for a pair of khaki linen shams for my spare bedroom that did not cost a fortune. These are thin, but that's okay since they are just for decoration. Definitely order a 28x28 down pillow to fill them and they'll look great! I love these and the colors they come in. I had to buy 2 colors and will probably buy more. The only down side is that if you don't take out of dryer immediately you will need to iron. The sham did not fit the pillow as anticipated based on measurements and description. The pillow does not stay enclosed due to the shams opening. Disappointing. The quality is just ok, not great but not bad. The size is bigger than a standard sized sham so it looks kind of sloppy on the pillow. Not sure if the measurements were accurate. These are my go to sheets - great colors and value! so light weight and bright! very thin material though, but they look nice! I ordered these in the gray but I returned them. The color was dull, no sheen to give life to the gray. I also did not like the cheap stitching for the flange.